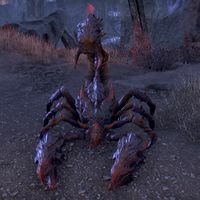 Skein Scorpions are large daedric scorpions associated with Mephala. They are native to The Spiral Skein, and also appear inside the College of Sapiarchs, as well as the Evergloam. Some will be summoned in the Skein to prevent Valsirenn from opening a portal. This page was last modified on 5 January 2019, at 22:14.